Sulabh International Museum of Toilets is a unique type of Museum, located on Palam Dabri road in South West Delhi. This Toilet Museum is showcasing the history of history of hygiene and sanitation. It is displaying the design of various toilet around the world from ancient time to current time. Here visitors can watch the ancient, medieval and modern types of toilets. The entire history of toilets is showcasing in the Museum and you can learn about the whole history of toilets. 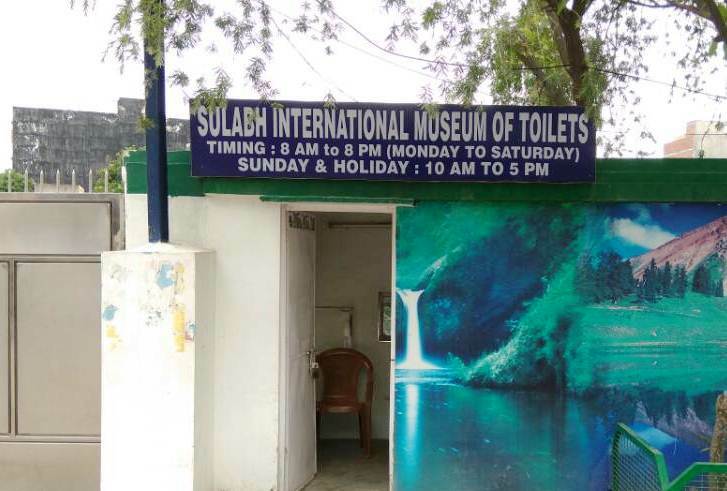 Sulabh International Museum of Toilets run by Sulabh International. The Sulabh Toilet Museum was established in 1992 by Dr. Bindeshwar Pathak (Founder of Sulabh International). Sulabh Museum is located in a Hall inside the Sulabh Complex. Sulabh Museum of Toilets timings are 8 AM to 8 PM from Monday to Saturday. On Sunday and Holidays Sulabh Toilet Museum opening and closing time is from 10 AM to 5 PM. It remains on closed only on national holidays. Entry is completely free here. Parking and guided tour of the museum is also free. Drinking water and washroom facility is available here. Photography is allowed here without any additional charges for digital cameras. It is located in Sulabh Bhawan on Palam Dabri Marg, Mahavir Enclave, Palam. This is a very busy road. Sulabh International Museum of Toilets nearest metro station is Dwarka Sector 10 of Blue line. Distance from Metro station is around 4 KM and the rest of the journey can be covered via auto rickshaws, battery rickshaws, Ola and Uber cab. The nearest bus stand is Mahavir Enclave, which is located outside the complex. It is a good place to visit along with the kids. Visitors should bring kids along with them so that they would know the importance of hygiene and sanitation. Air force museum Palam is another tourist attraction near this museum. Distance from Airforce museum to Sulabh Museum is around 5 KM.